Private Islands are the most popular port of call, according to CLIA, the Cruise Line Industry Association. Crown Cruise Vacations travel experts give five reasons to choose a Royal Caribbean cruise that features a visit to its private island of Labadee, so you can live like a millionaire for the day. Here are five things to look forward to on your cruise private island visit. 2. Water sports at the beaches — kayaking, snorkeling and parasailing are just some to choose from. • Paddle along the gorgeous coastline of Labadee on a relaxing kayaking tour. Your guide will lead you through beautiful coral reefs, where you’ll witness an abundance of exotic marine life. You’ll also pass various fishing villages that have been unchanged for decades. • Become a pirate for a day at Labadee Luc’s Splash Bash. Get drenched by ground geysers and water archways, battle other buccaneers with water cannons aboard the pirate ship, or explore the treasure map trail. • Soak up the sun while you float on the waves on a beach mat. • Enjoy the fun-filled floating Aqua Park as you bounce on trampolines and climb and slide on inflatables. 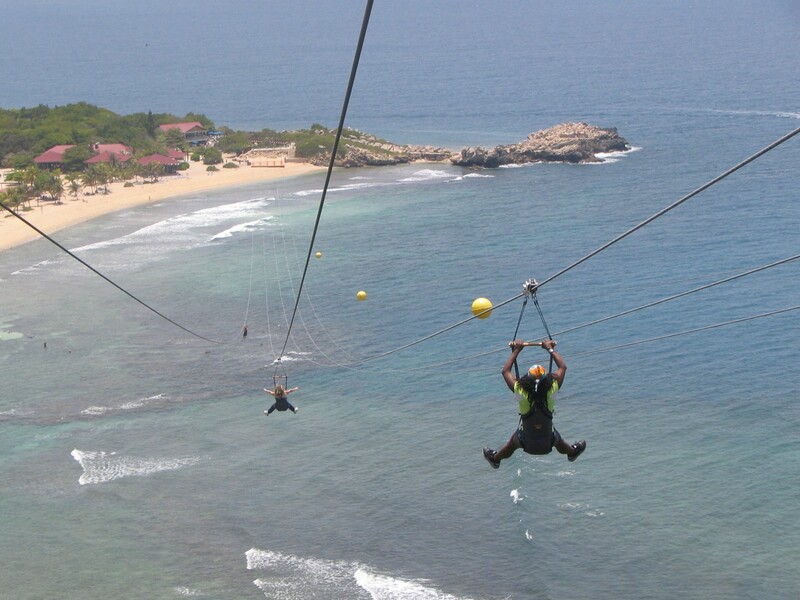 • Grab a bird’s-eye view as you soar 400 feet above the beautiful peninsula of Labadee on a thrilling parasailing ride. • Take an exhilarating ride aboard a waverunner down the scenic coast of Labadee. See your ship from a perspective rarely enjoyed by other guests. 4. Experience the local flavors – and relax at the same time. A “Labaduzee” is a signature frozen drink that is out of this world. Order yours from a shady hammock to capture the true spirit of Labadee. • Adrenaline Coastal Tour – Adventure-seekers will love this exciting ride and narrated sightseeing tour aboard a RIB, a small but powerful vessel that zips out from Labadee to cruise along the scenic shoreline of the island of Hispaniola. • Arawak Aqua Park — Come climb the only icebergs in the Caribbean at the Arawak Aqua Park. Enjoy bouncing on the giant floating trampolines, water slides, rolling logs and many other water toys that will keep you cool while having fun. Space is limited, so sign up early. Fun for adults and children. • Discover Haiti Coastal Cruise — Take a journey back in time and discover the jewel of the Caribbean, Haiti, the land of mountains and one of a kind coves and picturesque views. Your guide will take you on a journey of discovery onboard the “Discovery,” a specially designed motorized catamaran. Throughout your voyage you will view by sea breathtaking landscapes, beautiful reefs, a shipwreck, Amiga Island, coastal villages, handmade wooden fishing boats and the landmarks of the Arawak Indians and the early discoverers such as Christopher Columbus in the 15th century. Also, during your tour you will be able to see the Citadel, a fort nestled on a 3,000 ft. mountain which is considered to be one of the wonders of the world. Your discovery of the beautiful scenery, the rich culture and the history will be a memorable experience never to be forgotten. Royal Caribbean Independence of the Seas 8-Night Eastern Caribbean cruise, departs Feb. 16, 2013, round trip from Fort Lauderdale and includes ports of private island Labadee (Haiti); St. Maarten; St. Kitts; San Juan, Puerto Rico; and three days cruising at sea. Prices start at $799 per person, double occupancy. Royal Caribbean Allure of the Seas 7-Night Western Caribbean cruise, departs Feb. 24, 2013, round trip from Fort Lauderdale and includes ports of private island Labadee (Haiti); Falmouth, Jamaica; Cozumel, Mexico; and three days cruising at sea. Prices start at $849 per person, double occupancy. Royal Caribbean Oasis of the Seas 7-Night Western Caribbean cruise, departs March 2, 2013, round trip from Fort Lauderdale and includes ports of private island Labadee (Haiti); Falmouth, Jamaica; Cozumel, Mexico; and three days cruising at sea. Prices start at $799 per person, double occupancy. Crown Cruise Vacations is the preferred provider of PTV at Sea cruises, which enrich, inspire and entertain with informative programming presented by some of public broadcasting’s most acclaimed personalities. Crown Cruise Vacations was recently named North America’s Leading Cruise Travel Agent 2011 by the prestigious World Travel Awards, which acknowledges excellence across all sectors of the global travel and tourism industry. To work with a Crown Cruise Vacations cruise specialist for your next cruise vacation, call toll-free (USA/Canada) 877-283-1114, direct-dial 1+609-945-9801, or visit Crown Cruise Vacations at http://www.crowncruisevacations.com. MSC Cruises is offering balcony staterooms on select 7-night, Caribbean cruises for bookings made by August 31, 2010, providing savings of more than 25 percent on an affordable Caribbean cruise vacation where kids 11 and younger cruise free. Rates begin at $599 per person for balcony staterooms on select 7-night cruises to the Eastern Caribbean and Western Caribbean on MSC Poesia when she returns to the U.S. for her inaugural Fall foliage cruises to Canada/New England in September. Cruise-only rates are per person based on double occupancy for U.S. and Canadian residents. Government fees and taxes for all guests are additional; restrictions apply. Kids ages 11 and younger cruise free (GFTs are additional) when sharing a stateroom with two full-fare-paying adults. All cruises offer just a $100 deposit. 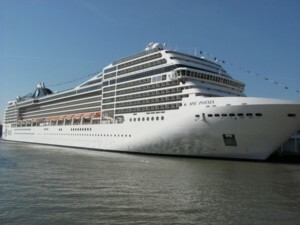 MSC Cruises makes a claim to being the fastest-growing cruise line in the world with the youngest fleet of 11 ships: MSC Magnifica, MSC Splendida and MSC Fantasia, MSC Poesia, MSC Orchestra, MSC Musica, MSC Sinfonia, MSC Armonia, MSC Opera, MSC Lirica and MSC Melody. The fleet cruises year round in the Mediterranean and seasonally in Northern Europe, the Atlantic Ocean, the Caribbean, US and Canada, (Fall 2010), South America, the Indian Ocean, and South and West Africa. For more information about MSC Cruises, visit www.MSCCruisesUSA.com, call 877-665-4655, or contact a local travel professional. Princess Cruises has launched a new “Caribbean Super Sale” offering customers significant savings on select 2010 and 2011 voyages. Travelers can choose to sail among the sun-swept islands for seven to 14 days, with fares starting at just $399.